we've all heard the recommendations: 'Drink red wine.' 'Eat less chocolate.' 'Put toothpaste on pimples." but the question is, does it really work? 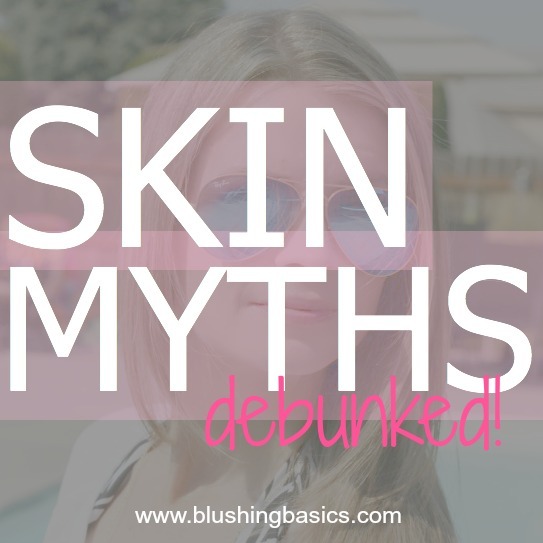 this month Eucerin has provided Blushing Basics with some skin care knowledge and debunking some persistent beauty myths. does toothpaste on pimples help? plain and simple - NOPE. do anti-wrinkle creams erase wrinkles? - no, but they do help to minimize the appearance of them. the most essential part of this equation is prevention which means make sure you are applying your SPF daily. washing your face with hot water opens up your pores. negatory. steam from hot water can help soften the skin making hardened dirt and oils easier to remove, but extra hot water can strip your skin of its natural oils. luke-warm water when cleansing and immediately moisturizing is key. bathing is bad for dry skin/eczema. baths are not the criminal when it comes to dry skin. the essential step in keeping skin moisturized is locking in the moisture after a bath (or shower if you prefer). you can lock in that moisture by immediately, and i am going to stress this one more time, immediately apply an emollient rich moisturizer after bathing. laying out poolside is the best way to get your daily intake of Vitamin D. this is a h-e-double hockey sticks no, sun tanning is not the answer. ask your doctor about supplements or adding Vitamin D enriched foods to your diet. it's all about genetics. yes and no. genetics do play a role in your complexion however how your skin ages is dependent on many variables including diet, sun exposure and smoking. moderation is key. please visit the Skin First Pledge Facebook page to get a sample of the Eucerin Daily Protection Moisturizing Face and Body Lotion with SPF. These are great debunks! Thanks for sharing! Thanks for the great giveaway & info!